In 2014, the prospect of performing electronic music 'live' can be exciting and daunting in equal measures. Thanks to the wealth of creative MIDI devices, samplers, synths, drum machines and gadgets available to musicians today, there are near endless options out there for anyone who wants to rework their studio creations for live performance - from simple laptop set-ups to elaborate full band rigs, and everything in between. That's where From Studio To Stage comes in. While, with so many potential live set-up options available, we can't simply walk you through the one 'definitive' way to take your music into the live arena, we can hopefully make the task a little less daunting by offering up some advice and expertise courtesy of our road-worn team of experts. If you need a little more live inspiration, head for our interview with London trio Factory Floor, to find out about the gear, techniques and inspiration behind one of the best live shows FM have seen in recent years. 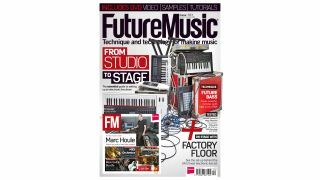 Get all of this, plus loads more tutorials, features and all the latest reviews, in the October issue of Future Music.